Here’s how you can make your very own Harry Potter nail varnish (it’s so much better than the Muggle-kind) – MP! Here at MP! we’re constantly thinking about what our lives would be like if we were sucked into the Harry Potter universe. C’mon, you must have too. How cool would it be to go for Butterbeer with Harry or have a charms class with Hermione? Personally, we’d like to whip up a charm that allowed us to hit the snooze button on our alarm clocks WITHOUT getting out of bed. We’d also like a nifty little one that sorted out our outfit for the day. As well as one that would give us a manicure because… we’re magical… so why the heck not?! So, the bad news is we can’t create a charm that paints our nails, but we have created the next best thing… DIY wizard-approved nail polish! Yep, you heard us correctly. Gorgeous, right? Well the great news is it’s super easy to create and we’re gonna show you how. Wands out, wizards! This polish is soooooo much better than the muggle kind. Luna would LOVE it and we reckon Ginny would be a big fan too. To start with we unscrewed the cap of a bottle of clear nail polish. This is going to act as the base of our Hogwarts DIY and helps mix everything together. Just like most DIYs on Maximum Pop!, you don’t need to spend galleons and galleons on the ingredients – so save that trip to Gringotts for another day. We picked up this bottle of polish in Poundland. Errrr…. sorry HP! nerds, we mean Galleonland. OBV. Next, we got some glitter. Feel free to be as creative as you like with this next step, wizards! We opted for the Ravenclaw house colours of blue and silver. We then poured the glitter into the bottle and gave it a quick stir with a cocktail stick. We recommend adding as many different shades of glitter as possible for truly magical results. Once we were happy with the colour, we screwed the top back on the polish and gave it a shake. Now, it’s the fun part. We decorated the top of the bottle with a Hogwarts wrap, which you can print off here. We also added a house logo. 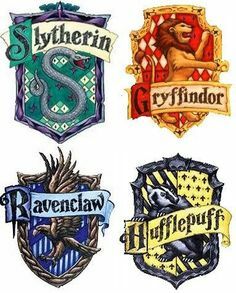 RAVENCLAW PRIDE! It’s as easy as that, you can now give yourself a wizard-approved manicure. We made four batches of the polish for each house. When we’re next in Diagon Alley, we’re def passing one onto all our HP! pals. Let us know which one your wizard friends would like in the comments below. Also, don’t forget to tweet us photos of your Harry Potter DIY creations @MaximumPop! Next article QUIZ: Are these Little Mix or One Direction lyrics? Quiz: How much of a rule breaker are you? Kick off your day with an extract from the debut of the year – don’t miss it! QUIZ: Are these Little Mix or One Direction lyrics?